AshleyNewell.me: TCP Inspiration: What a Blast! 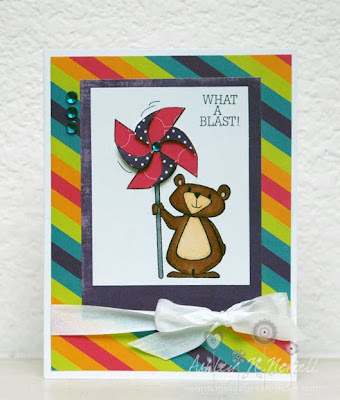 TCP Inspiration: What a Blast! Hi friends! I hope you're having a lovely day! I'm really looking forward today because I am going to a crop! It's been so long! I've missed creating with my friends and finding inspiration with them and from them. I'm very excited! Today I have a card using this week's inspiration from The Cat's Pajamas. The inspiration comes from my pal Jen del Muro and you can find the challenge on The Dancing in Pajamas blog HERE. It's a gorgeous one this week! I love the beautiful rainbow colors! I used my darling new What a Blast stamp set for this card. What's that? Copic coloring? ;) I know, I actually remembered how to cute them too. The paper is from the Life is a Party collection from Glimpses by Signify Pink. (Promise, there's a giveaway coming!) I used the Card Positioning Systems Anniversary Challenge 4. Ashley, this is adorable! Love the fun rainbow pattern in the background. Adorable Ashley! Thanks for playing along with the CPS Anniversary!